Ann Bonfoey was born in 1910 in Quincy, Illinois. Her father was a pilot and made sure Ann learned how to fly at an early age. Ann was athletically talented, mastering any sport she tried. The family sent her to an upstate New York boarding school where she excelled at tennis and dressage. Ann was also beautiful and the object of many young men’s attentions. This led to her father “arranging” a marriage with James Negley Cooke, Jr., a Princeton student, in 1928 when Ann was 18. 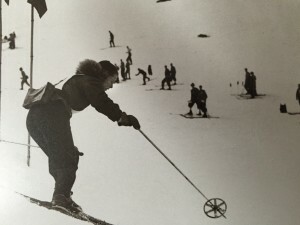 By 1938 Ann had become proficient enough to enter the National Ski Championships which were held in Stowe on the – you guessed it – Nose Dive. She finished ninth despite having to crawl across the finish line after falling. 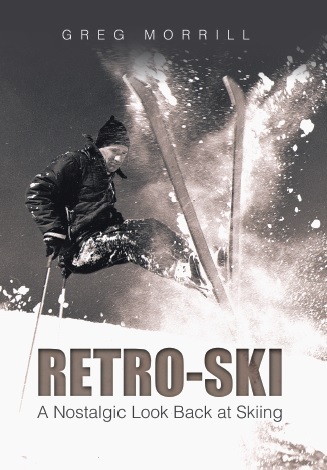 The following year Ann was invited to train with the United States Ski Team in preparation for the 1940 Olympics. However World War II intervened and those Olympics were cancelled. 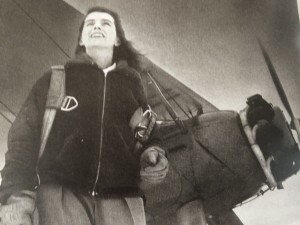 Ann returned to Stowe and in December 1940 Roland Palmedo would choose “Nose Dive Annie” to be the first official rider on the Mount Mansfield single chair. Greg Dirmaier was the first correct responder who identified Nose Dive Annie as the first to ride the single chair. Ed Hackett (for whom Hackett’s Highway is named) delivered the correct answer in the fog atop the Four Runner Quad on Saturday. In 1941 Ann’s husband left her for another woman and Ann suddenly was a divorced, single mother. To support herself she used her flying skills to train pilots for the war effort. She had been designing and making her own ski clothes so she also began to make skiwear for sale. 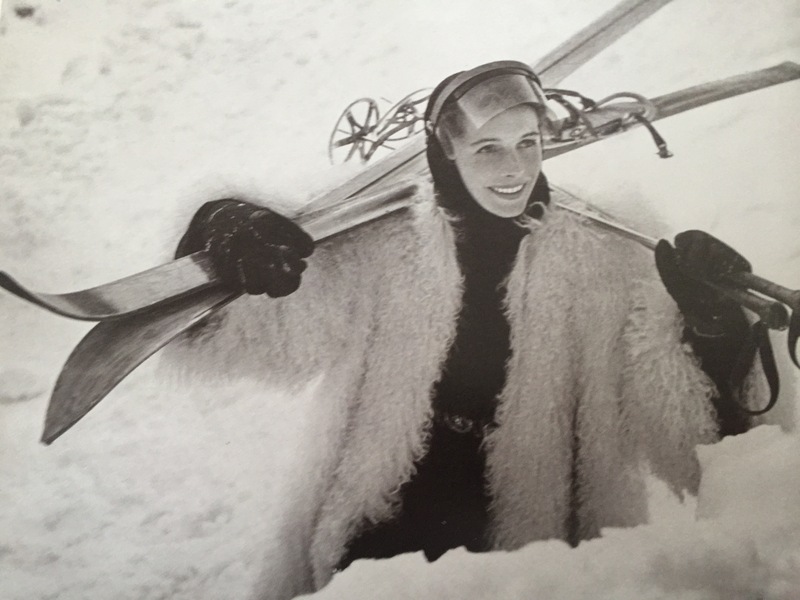 Harper’s Bazaar magazine featured her designs in a cover story and suddenly Ann Cooke Ski Clothes of Stowe was a success! Ann could not keep up with the demand on her own so she negotiated with Lord & Taylor to take over production for exclusive distribution rights to her designs. In 1947 Ann married Vernon Taylor, Jr., a Texas oil man. She became Ann Bonfoey Taylor and gave up her ski clothing business to be a wife and mother. The Taylors would be one of the early investors in Vail where they built a spectacular residence in the style of a grand French Manor. The Taylors’ influential friends in the fashion world, big business and finance, and entertainment helped make Vail the place to be. The parties that Ann hosted in their Vail home were legendary. Ann Bonfoey Taylor passed away on November 3, 2007 at the age of 96. An impressive share! I have just forwarded this onto a friend who was doing a little research on this. And he actually ordered me lunch due to the fact that I stumbled upon it for him… lol. So allow me to reword this…. Thanks for the meal!! But yeah, thanx for spending time to discuss this matter here on your blog.